We’d love your help. 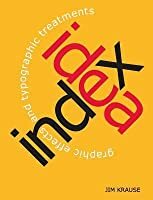 Let us know what’s wrong with this preview of Idea Index by Jim Krause. It's tough to be creative on command. And with deadlines looming, you can't wait for inspiration to strike. That's where Idea Index comes in. Don't let the small size fool you. Inside you'll discover thousands of big ideas for graphic effects and type treatmnts — via hundreds of prompts designed to stimulate, quicken and expand your creative thinking. Sit! Stay! Be Creative! That's where Idea Index comes in. Don't let the small size fool you. Inside you'll discover thousands of big ideas for graphic effects and type treatmnts — via hundreds of prompts designed to stimulate, quicken and expand your creative thinking. Use Idea Index to brainstorm ideas, to unclog your mind, and to explore different looks and approaches. To ask other readers questions about Idea Index, please sign up. An average quality compendium of "ideas" for graphic design projects. It runs through some assorted concepts to help you during your more fallow periods... It will show off an example of juxtaposed elements or how to create an impact with differently sized elements or how to create tension with "misplaced" design elements, etc. Unlike its siblings (i.e., Color Index and Layout Index) I wouldn't really describe this one as a "best practice" guide. That doesn't make it bad... It just didn't seem An average quality compendium of "ideas" for graphic design projects. It runs through some assorted concepts to help you during your more fallow periods... It will show off an example of juxtaposed elements or how to create an impact with differently sized elements or how to create tension with "misplaced" design elements, etc. Unlike its siblings (i.e., Color Index and Layout Index) I wouldn't really describe this one as a "best practice" guide. That doesn't make it bad... It just didn't seem as useful in the long-run. I could see how it might be very useful to some folks -- there were certainly times when I got some good ideas from it -- but for the most part you're probably better off just looking for inspiration in the things around you in your everyday experience. Another book I keep on my desk at work. Makes for a great reference book and can help jog my brain to get out of an endless loop of similar designs. However, I find this isn't the first book I generally reach for to get inspired. When I'm brainstorming or low on inspiration, I love to have my "index" books handy. Small book that spark an inspiring journey to the design exploration. Good for designer that needs a jolt for the brain. After reading this book, I use it as one of my reference book.